There you have the template for one of the oldest of the classic cocktails. Various stories place the invention of the Manhattan in the 1870s or early 1880s, predating even the venerable martini. As with many of the great cocktails, there seems to be some mystery about its whereabouts before its first appearance in print; the Manhattan is first recorded in the 1887 edition of Jerry Thomas’s Bon Vivant’s Companion . The Manhattan that Kingwell describes, the one in general circulation these days, is based on the Savoy Cocktail Book’s “Manhattan Cocktail (No. 2)”*, a blend of two parts Canadian Club whiskey, one part sweet vermouth, and a dash of bitters—shaken, alas! Modern mixology makes it a blend of two to four parts whiskey, one part vermouth, and a healthy spicing of bitters. So what about other whiskies? For starters, if you’re a Scotch lover there’s the Rob Roy, which is made on the Manhattan plan, but with your Scotch of choice. As for blended whiskies, never, ever, let some bartender try to tell you that Manhattans should be made with something like Canadian Club. I don’t care what the Savoy Cocktail Book says, that’s just wrong. The idea that CC can replace a good rye whiskey is just a canard left over from Prohibition. Canadian is a completely different whiskey style, and the Manhattan is no place for Canadian whiskies. 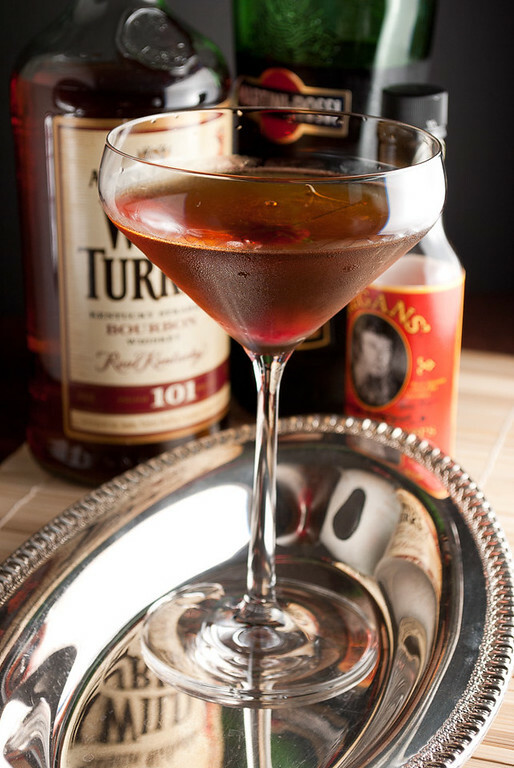 The Manhattan is never shaken—stir with ice until very cold, then strain into a well-chilled cocktail glass. Optionally, garnish with brandied cherry. Spirits: The Cold Glass benchmark rye is Rittenhouse 100. As noted above, I usually go with Bulleit or Maker’s for bourbon Manhattans. Part of the attraction of the Bulleit is the rye-ness of it, but it is also relatively higher proof than many, making for “a more incisive and balanced drink,” as David Wondrich puts it in Imbibe! Bitters: I generally stick with Angostura, or occasionally Fee Brothers Whiskey-Barrel Aged. A drop of orange bitters can be very pleasant in a bourbon-based drink; orange peel makes a very nice garnish for that formulation—and gives you the “Uptown Manhattan” of Jeff Hollinger and Rob Schwartz’s Art of the Bar . Garnish: The maraschino cherry is the traditional garnish, but I’ve never met anyone who had access to real ones—just the ubiquitous neon red ones. Instead, you can follow the minimalist route and go garnish-free, or garnish with lemon or orange peel. I prefer one brandied cherry; these are incredibly easy to make, and there are lots of recipes on the web. Stir: Many sources, including some that should know better, suggest shaking Manhattans to chill. That’s very naughty, I don’t know what they’re thinking on that. Shaking generates an unattractive, cloudy drink with a long-lasting layer of soapy-looking bubbles across the top. * The Savoy has a “Manhattan Cocktail (No. 1),” of course, essentially a glass of vermouth with some whiskey in it. I’d love to know the story of how the drink evolved from (No. 1) to (No. 2). Robert Hess provides a video, with some background on bitters. “Manhattan Cocktail, Cold and Dusky” at cold-glass.com : All text and photos © 2010 Douglas M. Ford. All rights reserved. Don’t knock Manhattan Cocktail (No. 1) until you’ve tried it, especially with a cask strength Bourbon or Rye. It is actually pretty tasty. It is, by the way, more or less verbatim, the Jerry Thomas version of the Manhattan. Interesting what 50 years or so can do to a drink. Erik—I did see your writeup on (No. 1), and I came close to adding a link to your endorsement. The post was getting long, so I cut out the side trip to a (No. 1) discussion. In fact, your evaluation of the tricked-out version makes me want to give it a try one of these days. Alas! that I didn’t have the ingredients available to match your preparation. I’ll just have to overcome the “Looks Too Weird” aspect of the recipe and give it a try with the ingredients at hand. (It certainly wouldn’t be the first time I’ve been happily fooled by “That Can’t Possibly Work” formulas.) So you really are going to push me into buying cask-strength whiskies, aren’t you? Thanks for the encouragement. Add a few drops to a dash of Calvados for some pizzas. I call that a Big Apple. OK, I will. Thanks for the idea. Love love love your blog. I’ve been working through the posts and making each drink. I’ve learned so much and thank you for it. Beautiful work. Thanks again. Thank you, Eric, what a delightful compliment. I’m glad you enjoy Cold Glass. Happy cocktailing! Hi Doug. 4 1/2 years on from your original writing and it’s still drawing comment! That is a classic in its own right! As classically, stir over ice until very cold and strain into a well-chilled glass. I garnish with a cocktail cherry, which I make very simply myself from canned/preserved pitted black cherries from which I pour off the accompanying sugar syrup and steep in Luxardo Maraschino for a week or so. I’m delighted to hear from you, Philip. I’m happy you can get the High West Double Rye—I enjoy that one, too, and it’s fun to know it’s available in Hong Kong. Your Manhattan sounds lush, indeed. I’m not familiar with the Giffard Vanille, but I can imagine the general combination with the High West and the Carpano. It would be easy drinking, indeed. Thanks for the good words, and for sharing your recipe. I couldn’t be happier with your description of the Manhattan; it’s very nearly exactly how I make it at home (mine goes with 2 dashes angostura). Manhattans are far and away my cocktail of choice (preferably with Bulleit Rye, but Maker’s is fine for when I’m out! ), but, ironically, it’s a different drink every time I order it unless I specify, VERY specifically, what I want. Considering it’s barely even 3 ingredients and 150 years old, it’s a bit pathetic that this is an issue. If I just order “a Manhattan” at a bar that isn’t specifically a speakeasy, it will be shaken, and 60% of the time it will come on the rocks. I mean, honestly, what’s the bloody point of even having a name for the thing if it’s so open to interpretation? And how do you become a bartender without knowing you never, EVER stir clear ingredients? I’m so sick of Manhattan slushies that I’ve taken to saying “I’d like a Manhattan, please, with [insert whiskey here], stirred, and served up.” Overly verbose, if you ask me, considering the Manhattan is a specific thing… but I digress..
Hi, Patrick, yes, I agree that the Manhattan can be a risky order in a bar. Around here, the default seems to be shaken, and on the rocks. What th’…? I’ve found that I have to specify “up” and “stirred.” Which means, of course, that I really only order Manhattans in places where I’m a regular, and busy bartenders are willing to cut me a little slack for slowing them down. Or, as you say, in craft bars. Thanks for commenting, it’s gratifying to know you enjoyed the post. So, I’m writing this from the bar of a local distillery here in Michigan, where the otherwise excellent bartender misheard my order of a “Manhattan made with the house rye, 3 to 1, heavy on the bitters,” and thought that I had just ordered a Martini made with unaged rye whiskey instead of gin. It was very sweet of her not to correct my supposed misuse of the Martini name, and now I am drinking a stirred, chilled, up “ghost Manhattan.” It’s interesting…I could never mistake it for a Martini, there’s a real disconnect between the spice of the whiskey and the herbs of the (housemade and unrefrigerated) dry vermouth. I do not love this drink. But the bartender made it with such exquisite attention to technique…And it’s not terrible, just not great. I’ll finish, pay up, and come again. Well, Jacob, it seems you like your Manhattans the same way I do.